In the early 1990s Morecambe’s sea walls and Promenade were in dire need of repair and the town’s tourism industry was suffering. Lancaster City Council successfully applied for substantial government funding to help solve both problems. The solution was a massive civil engineering to reconstruct the sea walls and Promenade, at the same time incorporating public works of art into the structures. 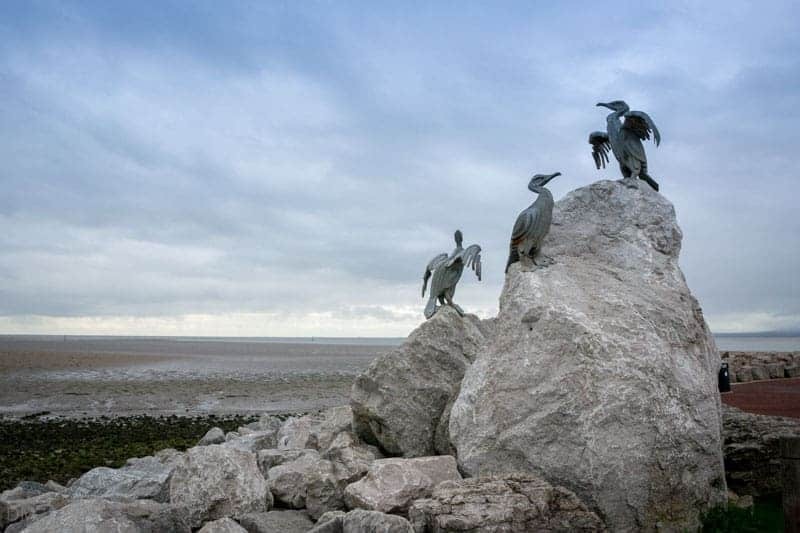 As much of the public art was themed around Morecambe’s birdlife, the reconstruction work was named The Tern Project. 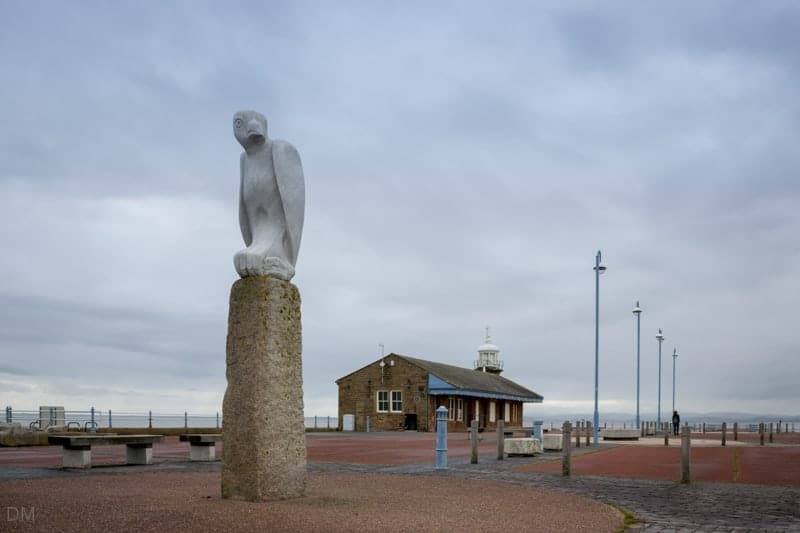 The Tern Project has seen numerous piece of public art incorporated into structural improvements to the Promenade, sea defences, and elsewhere in the town centre. The Stone Jetty, originally built as a cargo wharf, is one of the highlights of the regeneration programme. Artists such as Russell Coleman, Gordon Young and Brian Fell created numerous pieces here including Compass, Mythical Bird, Maze, Magpie Hopscotch, and Cormorants. The Stone Jetty is one of the best places in town to view the magnificent sunsets over Morecambe Bay. 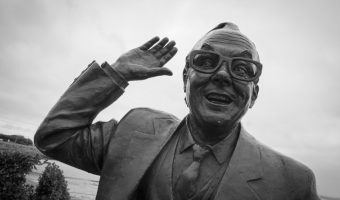 The statue of Eric Morecambe is the scheme’s most famous piece of art. 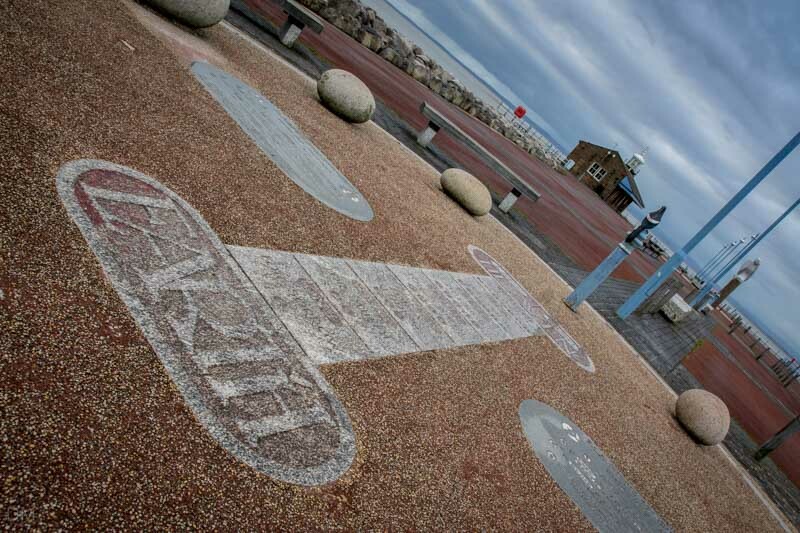 The surrounding area is engraved with the words of the song Bring Me Sunshine and the names of celebrities who appeared on the Morecambe and Wise Show. Visitors come from all over the country to pose for a photograph with ‘Eric’. Other works include the Rock Islands bird sculptures at traffic roundabouts by Brian Fell and Gordon Young, and the Bird Fence by David Kemp. The Tern Trail is a self-guided tour of The Tern Project that takes in most of the sculptures. It starts and finishes at the Morecambe Visitor Information Centre. Trail leaflets can be picked up from the tourist office. The West End Gardens is a public park running along the Promenade from Regent Street to Alexandra Road. It features several children’s play areas, water fountains, picnic tables, a café, and several pieces of public art. In April 2007 ancient byelaws prohibiting cycling on Morecambe Bay were lifted. A traffic-free cycle path runs the length of the Promenade from Heysham to Hest Bank. Morecambe Promenade Train Station closed in 1994. It now houses The Platform performing arts venue and the Morecambe Visitor Information Centre. The Station, a family pub with an indoor children’s play area, is also here. The iconic Art-Deco Midland hotel reopened in 2008 after being refurbished by Tom Bloxham’s Urban Splash. 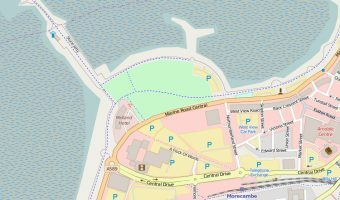 Map showing location of Morecambe Promenade. I visited Morecambe in 2009 and found it a peaceful place where one could unwind. l am due to visit September this year with the intention of there maybe next year. The café on the Stone Jetty is to open again under new management. Improvement work is currently being undertaken and the café is expected to reopen in early 2015. I live in Blackpool and visited Morecambe for the first time in my life yesterday. I stayed for only 4 hours but loved it that much I decided I would like to move my family there. Blackpool has spent a lot of money on regeneration but Morecambe looks better. It could do with more shops and a main shopping/town centre but it’s a nice peaceful place. Just returned from four day break to Morecambe bay, 3.7.09; our first visit – stayed in static caravan at Ocean Edge. 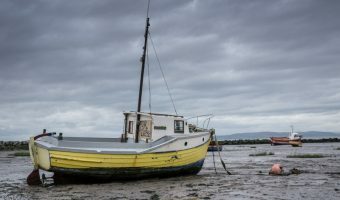 Morecambe is still showing the effects of decline, as is well known and expected. But, the signs of investment and regeneration are also very apparent and extensive, especially on the promenade, which is most pleasant. Note the splendidly improved big white hotel! I twice cycled the promenade from next door Heysham to the northern side of Morecambe and back – superb smooth cycle surface, interesting throughout and plenty wide enough to give pedestrians a wide berth. Plenty of other cyclists, too. Don’t miss visiting the stone jetty. I noticed some stretches of good quality sand for sun bathing and to keep the kids happy. The Council workmen and ladies were at work very early morning carefully cleaning the beach and tending the promenade gardens. The views over the bay, to the Lake District are excellent; indeed, sunset over Black Combe is magnificent. Well worth a visit. The Tern Project is a shining example of how public money can be used to regenerate an area. One of Morecambe’s most popular attractions and photo opportunities is Graham Ibbeson’s Eric Morecambe statue.